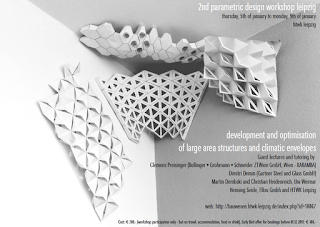 The workshop will be concerned with the development and optimization of large area structures and climatic envelopes. Using Rhino and Grasshopper based tools such as Karamba and Geco/Ecotec parametric and iterative methods are to be used for system optimization. Limited rapid prototyping tools will be available for physical modelmaking.